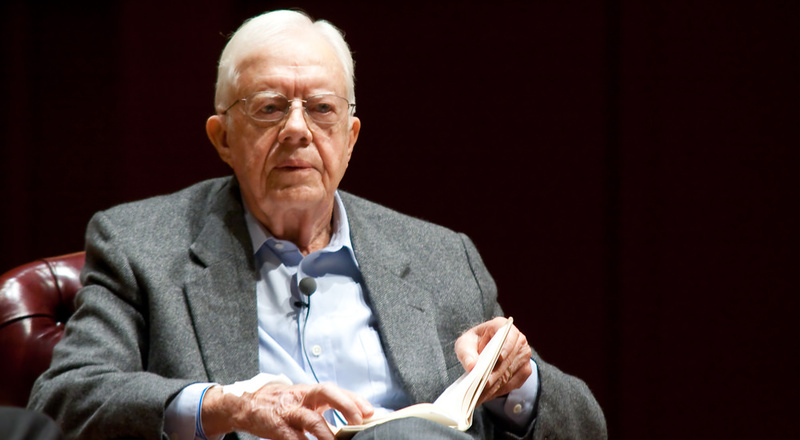 The Globalist Subterfuge of Trump-Defying Jimmy Carter! For the naive and the trolls, who say former President Jimmy Carter is irrelevant today, one only has to view the following video of July 13, 2017. Please click here! This video was banned, ten minutes after processing, on YouTube, Metacafe, and Facebook. Facebook added a 72-hour posting suspension! As some suggest, is 92-year old Jimmy Carter irrelevant today? No more than the aged Soros and Kissinger and Rothschild! Is Carter irrelevant? Khazarian globalist George Soros doesn’t think so! Globalist Masons and their “refugee” Muslim dupes, which Carter diligently resettles, don’t think so! And why is not this president – who tied with Obama as the worst president of America – working to build homes for the homeless American veterans which served him? Scrutinize Carter’s globalizing social, political and economic microcosm – of an enslaving globalist model – on this video by clicking here. It is a portable feat of social engineering, with extremely tight routine media controls. All these components in this video are socially engineered and geared, imposed and subjugating from the top down, to form a “grass roots” consensus. * A pre-conditioning slave-labor model – under the mind-controlling guise of “volunteerism” – activated in a 2012 executive order by Obama, legalizing slavery, which President Trump must nullify immediately. And when these resettled Muslim “refugees” reach 51% – and all Muslims contribute to this, whether, traditional, terrorist, moderate, progressive or secular – Sharia becomes the dreaded Law of the Land. Jimmy Carter diligently works toward this goal, as resettled Muslim “refugees” advance Islamic incremental imperialism in their political Islam agenda. * Note all flag’s including Canada’s fly at an equal height. This is the globalist diminution and wreckage of nationalist symbols. That is, a country’s flag traditionally waves above all other flags to take precedence…. * Even flying in Canada – in the tightly-controlled globalist and Marxist Multicultural Habitat for Humanity- are two American state flags turned globalist. The South Carolina flag with its crescent moon and the “California Republic” flag with its communist Red Star! A former President of the United States knows better than to do this! This reveals the leftist/globalist Democrat Carter is complicit with Russia, which allows a “California Republic” Embassy in Moscow, socially engineered to appear as the will of the “grass roots,” when it is globalism destabilizing, de-nationalizing, and carving up America into regions! * Toward the end of the video, note the Muslim security guard, very frustrated, because he can do nothing to the Vigileaks cameraman filming from across the street. Today, as a growing globalist threat, more and more Muslim “security guards” are hired for sensitive positions, including major North American power plants. The presence of this one is to desensitize the “volunteers” – soon to be slaves and subjugated, second-class dhimmi – to his Muslim “security guard” presence. * Inside this alleged non-profit organization globalist project, Soros approved, is a cameraman. Look closely! This undercover agent (CIA?) points his camera at the Vigileaks cameraman. And the camera of this “construction worker” is easily worth more than three cars! Every construction site should have one, don’t you think? Much more can be said! But the bottom line is that President Trump needs to build the northern wall now! Or a completed southern wall will merely be the laughing stock of globalists…. Send this to loyal Trump Administration today!